Check out our new inventory of automated and intelligent lighting fixtures available for rent. Let SLS light up your next big show, TV shoot, or corporate event! SLS Production Services LLC has installed professional audio, video, and lighting systems throughout Michigan and the surrounding states. SLS Production Services LLC designs, sells, and installs professional sound, theatrical lighting, and video projection systems for churches, clubs, theaters and more! SLS Production Services LLC rents a variety of systems and equipment for a multitude of applications. The lists below are a sampling of the sound and lighting equipment Stage Lighting and Sound, Inc. commonly rents. SLS Production Services LLC is a sound, lighting and video production company. We have provided production services for over three thousand shows with national acts as well as corporate events, religious crusades, Christian youth conferences and other events. 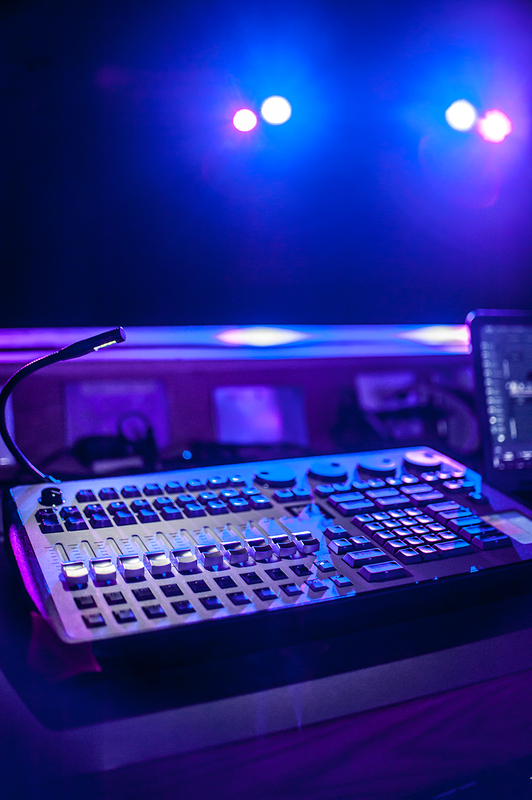 SLS Production Services LLC designs, sells, and installs professional sound, theatrical lighting, and video projection systems for churches and other facilities throughout Michigan and surrounding states. Our services include consulting, room analysis, system set-up, calibration, testing, and service. We sell only name-brand professional-grade equipment and have been in business for over thirty-three years. We design acoustical solutions for rooms that do not comply with nationally accepted standards for live sound reinforcement. As dealers for over 140 manufacturers – and because of our “hands-on” experience with most of the products we sell – we can offer you a single piece of equipment that fulfills your exact requirements or design a complete system without trial and error. Because we utilize the products we sell often, our technicians are always up-to-speed with current technology and how to use the products we sell and rent. Speaker system design is done using EASE® v4.0 software, which means that we know how the speaker system will perform before it is installed in the room. We use SmartLive® to analyze a room and calibrate the audio system to the space. Specialized Lasers are used to aim speakers, which eliminates errors and assures proper coverage of the seating area. 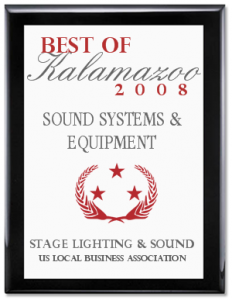 Stage Lighting and Sound, Inc. has completed over one thousand installations – from small country churches, costing a few thousand dollars, to mega churches and auditoriums costing hundreds of thousands of dollars. We can provide you with technical assistance and training by professionals with years of experience mixing live sound and lighting design. The training of your operators is without arbitrary time limits to insure they are comfortable with the features and functions of any piece of equipment you purchase. In 2007, SLS Production Services LLC installed the largest AFC System in America in Miller Auditorium at Western Michigan University’s campus in Kalamazoo, Michigan. This system ampliefies symphony orchestra without the directionality of a main PA system. Click here for more information about the installation and the system.